Deb joins her husband for a three-month trip to New Zealand when hes hired by a film studio in Wellington. Leaving behind all that is familiar in her comfortable corner in Southern California, she realizes that the past twenty years have been so tightly woven into the life of her only daughter that shes not sure who she is on her own or with her husband. In her isolation, Deb begins to contemplate reinventing herself, but before her crazy schemes take flight, she meets Kelli at the Chocolate Fish Café. Even though the two women are very different at first glance, they find they share a common Sisterchick heart and instantly forge a friendship that takes them on a journey where both Deb and Kelli find that God has returned to them the truest part of themselves that was set aside so many years ago. Sisterchicks Down Under! : a Sisterchicks Novel by Robin Jones Gunn was published by Waterbrook Multnomah in March 2005 and is our 36532nd best seller. 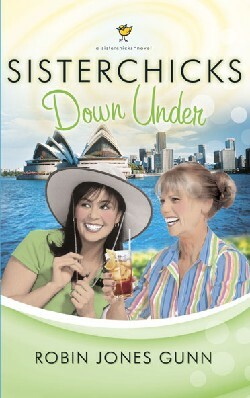 The ISBN for Sisterchicks Down Under! : a Sisterchicks Novel is 9781590524114. Be the first to review Sisterchicks Down Under! : a Sisterchicks Novel! Got a question? No problem! Just click here to ask us about Sisterchicks Down Under! : a Sisterchicks Novel.